8:30 Pm: It is still light, I love this time of year, Spring is by far my favorite time of year...........I just went out side for my espresso and such. I see my cats are out watching the new birds. I see the new mother has brought them out to a spot I can't see, interesting.........I hope she keeps her new ones safe. My cats are not interested in food tonight so they are having a good time. Susan OK, Lee Pharmaceutical made me quit my job, I made $60,000 on that one stock so I thought I was rich. Susan Fandel, nice name similar to Zinfandel I met at my last job and she she was OK, until I told her I had quit my job, she got so upset, those days people did not quit a good job, most of us were only making 6 to 7 hundred dollars a month, but I had a 1969 Corvette I bought for $7000 and owed 150 a month, easy. My mortgage payment in Fairfax was $125 a month. I thought I could survive, I had a finance degree? but Susan did not think so, so I think that was the last time I saw her in 1972 because she had no faith in me. I hope she is doing well now. I worry about dementia for me. I know of many friends who have had problems so I want to document if I have dementia, of course we called it something in a different time so I will not go in to that now. BUT I know I have slowed down. I used to not want to go to bed until 11pm and if I did I thought I was not doing good, now I go to bed maybe by 10 or so and read so I have accepted that but as I have said I want to be a wake all times. I want to learn more about . dementia what is it .........tonight I got upset because Pat did not come up to let me know what she wanted extra for this nice dinner I prepared. It has been a tough day for her like me with our new offering. I had some nice rare Rib and corn on the Barbee, but she did not come up until 6:30 so I got upset. It was not dementia on my part, just not a nice person. so Yes we have friends and relatives who are questionable according to their relatives, maybe not what they used to be...............so of course I want to make the best wine I can and I have to ask everyday in ways: how am I doing? Our new 2017 wine form is up and I have heard from several, I lowered my prices so why do that? I am paying taxes to this new Government so I want to lower my prices so I pay less!! Does that make since? 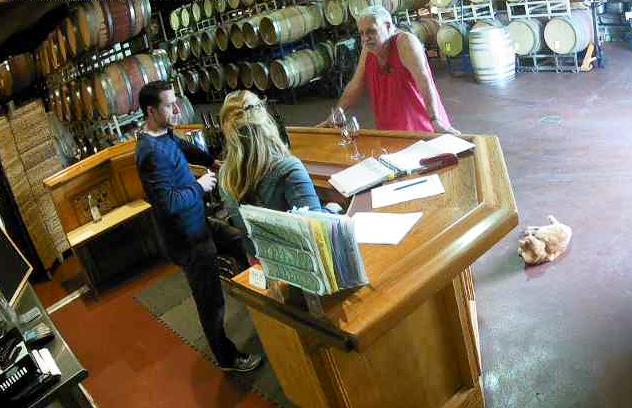 I found out the other day Catalina and Jesse who are in the tasting room do not violently swish wine in their mouth, actually I was told they just sip and let it go down. They also taste wine by pairing with food. I do not. I feel the only way to decide the greatness of wine is to swirl. Even a taste of water before tasting wine will change the whole experience. Pronounced (Al-ee-Anico), this Oh-so-drinkable Italian varietal wine is ethereal, with delicate violet aromas. Its integrated tannins and slight chalkiness show simplicity in the mouth while maintaining the big fruit that we are known for. Pronounced (Al-ee-Anico), this oh-so-drinkable Italian varietal has delicate violet aromas. Its integrated tannins, full body, and slight chalkiness show pleasant acidity while maintaining the big fruit that we are known for.